It took me three years to finally make it to an Arizona Storytellers event — for shame! 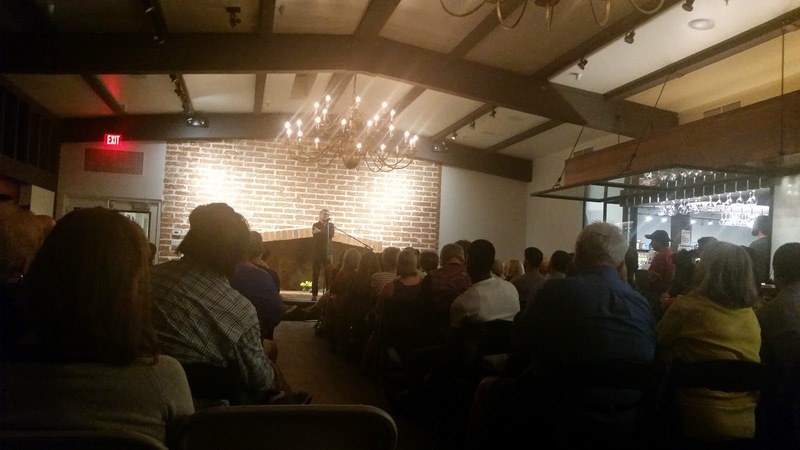 Last month I finally decided enough was enough and purchased my ticket to the August event held at First Draft Book Bar, a new bookstore/bar in my neighborhood. It was perfect: The theme was the city of Phoenix (my first love) and the event was being held at a place I’ve been dying to check out. Graham and I have watched the former Beefeaters restaurant go from an eyesore to a cool new venue that also houses Southern Rail restaurant. I don’t have many photos because, as host Megan Finnerty (a former coworker of mine) said, the event really isn’t Instagram- or tweetable. It’s more about listening than taking photos. And I’m glad I put my phone away to hear the touching stories. At least two of them brought me to tears: one was about a father-daughter relationship and the other was about Navajo Code Talkers and a 50th anniversary ceremony held for them in the ’90s. Another story, told by chef Aaron May, made me tear up for a different reason — it was just so damn funny. I didn’t expect the night to be so emotional. I should mention that our tickets even included a drink each. It was the best $11 (each) I’ve spent this week. Interested in checking out this awesome event? The next one is September 10 and will be held at the Phoenix Theatre. The topic is Stories of Our Phoenix Families. One I am especially looking forward to is the December event at the Arizona Biltmore, where stories of holidays will be told.